You just found a $100 bill! You won a Corvette at the mall! Your hair grew back! What's with all this Luck? 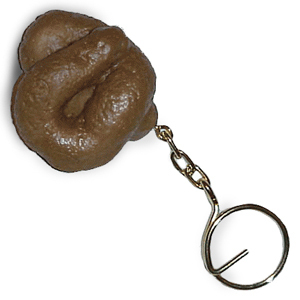 Shhh, it's the Lucky Poo Poo Keychain of course. This petite pattie on a Keychain will make your wildest dreams come true and grant you all that you truly deserve. You'll be looking at everything with (brown) rose-colored glasses from now on! - Made of rubber and metal.